Accutech believes strongly in education. Not only within our own laboratory but also with our clients and orthodontic programs in universities. We realized years ago of the lack of appliance and lab training within the profession. It is one of our goals to fulfill this shortcoming. 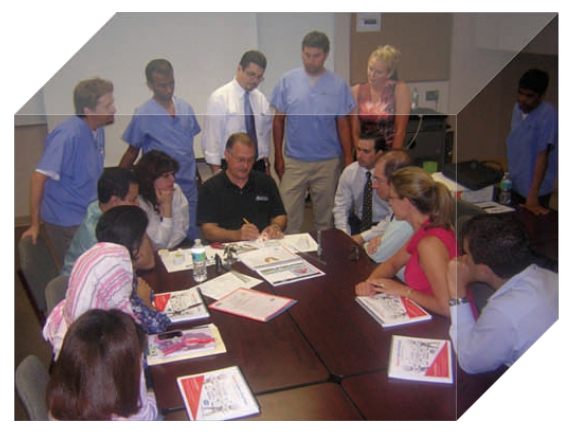 We offer “Lunch and Learns” to orthodontic residency programs across the USA. Accutech also offers extended lab training sessions such as appliance fabrication boot camps. These programs are designed and customized to your needs in regards to content and duration. We further recognize the difficulty and challenges that residents face upon graduation so we offer a post graduate discount program to all the universities that we visit. Each resident can receive a 10% discount on all appliances for one year. Contact Daryl Mathias directly to set up a “Lunch & Learn” or discuss any other lab training needs that may help support your program. 1-866-536-3311 or dmathias@accutechortho.com. I have been really pleased with your attention to detail in every aspect of the removable appliance process: from the turnaround time for each case to the personal phone call or note concerning a potential problem with an individual’s case that might make the appliance not fit correctly. Thank you for treating each case as though you were making it to be placed in your own mouth.